Deborah van Deusen Hunsinger, Charlotte W. Newcombe Professor of Pastoral Theology at Princeton Theological Seminary, earned her MDiv from Yale University Divinity School, and her MPhil and PhD from Union Theological Seminary in New York City. She was also a matriculated auditor at the C.G. Jung Institute in Zurich, Switzerland. 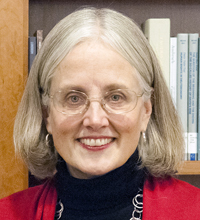 An ordained Presbyterian minister, she is interested in educating clergy and laypeople to offer theologically sound, psychologically informed, and contextually relevant pastoral care in the church. In addition to her doctoral seminars, she teaches courses on the theory and practice of pastoral care, pastoral counseling as a ministry of the church, marriage and family, prayer and pastoral care, compassionate communication and restorative practices, the psychology of C.G. Jung, and trauma and grace. As a Fellow in the American Association of Pastoral Counselors, she has received extensive training in a variety of therapeutic modalities, having worked with individuals, couples, families, and groups. She is a member of the Society for Pastoral Theology and of the Karl Barth Society of North America.